‘Our Finest Hour’ is the new tour with the BBC Big Band Featuring vocalist Annie Gill and Presenter Kevin Whately. Our Finest Hour looks back in words and music at the momentous turning point of World War Two, and Britain’s finest hour, from the miracle of Dunkirk to the decisive victory of the Battle of Britain. A total of 22 musicians in the big band provided the ‘wall of sound’ to recreate music from the era. This was overlaid with vocals by Annie Gill, as well as recorded speeches and stories told by Kevin Whately. The tour travelled with all of the sound kit, apart from the FOH PA, and would tour, setup and perform in 1 day. The tour was prepped at Stage Sound Services in Cardiff. During the first venue of the tour (Symphony Hall, Birmingham), all of the looms to the trumpet/brass/wind section were made up to allow a very quick setup and strike at the venues after this. These looms were also colour coded to make the setup and fault finding easier. The stage box also replicated what was on the looms to make the whole setup idiot proof. In some cases, the looms for the microphones would carry speakon along the side of them, for where monitoring (albeit minimal) was needed. The FOH Desk (Yamaha QL5) was connected to the stage box via a 90m Cat5e Loom, loomed with power. This loom allowed power and control from virtually any position in the auditorium, which was very helpful given the different sizes and specifications of each venue. The setup provided light amplification for the ‘big’ band, whilst also allowing the vocals and speech to sit gently over the top of the mix. 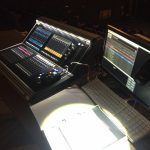 Whilst the musicians were very good at mixing themselves, the FOH mix often vastly differed from each song, mainly due to the dynamics and orchestrations of each number. – Something that definitely keeps you on your toes.